G&L is really into semi-hollow thinline stuff these days. Our feature today- currently available at Guitar Adoptions - sports a quilted maple top on an ash body. A close-up look click reveals wood body binding as well. It includes molded hard shell case and cert signed by Phyllis Fender. Although G&L also makes conventional single and double coil pickups, the Z-Coil pickups pictured, are the standard config for the Comanche series, and also available on certain ASAT models. Click Here for a good demo video comparing a similar Comanche to a Legacy model with standard singles, maple top and semi-hollow body. The comanche sounds fatter. 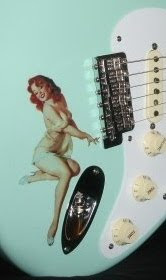 Guitar Adoptions maintains a large selection of premium model, new and pre-owned G&L's. They also stock more lefty models than most dealers out there, so tell your lefty friends to check 'em out. Other guitar lines include Michael Tuttle, Flaxwood, Delilah, Giffin & Larrivee electric solid bodies.